“No man is an island, entire of itself; every man is a piece of the continent, a part of the main.” John Donne. The door creaks open and in they come, an eclectic assortment of sympathetic, lovely souls. Mid-week tired, slow, winter-cold or summer-hot, they shuffle over our threshold and sit on straight-backed chairs, not enough overstuffing for all of these. My heart leaps up as they begin to settle. I slow to look, quiet to hear, and sit in wonder. My, what an odd lot we are. A bunch of broken scarecrows scratching around, finding seats, cozying up on the couch, too many folk, too little couch. Doing what people do. Getting coffee, fetching water, petting the dog, eating one of those butterscotch cookies Allen bakes every week for this Bible study. On the lookout for a little more peace and a little more grace, we come to open the Book, to seek. What great importance there is in crossing thresholds, what hopeful vulnerability dwells there. A threshold is a weighty place, a place to remove a mask if we can remember to try, to lay aside the face we’ve prepared “to meet the faces that [we] meet,” as J. Alfred Prufrock puts it. He never could accomplish it ~ I want to try. Folk ease in and smile their gentle smiles, and I smile mine. People like me, afraid, but with a great longing to be known, a deep desire to be forgiven. My, what a peculiar lot we are. The bringer of cookies has lost his brother. He bakes as he heals, it seems, slow and steady. He crosses this threshold with hands full and crosses back with heart full, it’s a pretty good trade-off, week after week. There’s hope in it. One friend is in constant pain in her back, one has arthritis in her knees and can’t play tennis any more. One of us has lost her voice and the doctors can’t seem to figure out why. She goes back to doctors to see what’s to be done. This friend has never had children. The other week our regular church nursery worker couldn’t come at the last minute, and I was looking for quick help and ran right into her in the hallway. I could use your help (me). I’d do anything for you (her). Could you watch the littlest ones today? (me) Long pause. I never had kids, you know (her). Yet she did it anyway, for love, and the littlest ones ran and clung to her, smiled and loved her, kissed her with the wettest of sticky-kisses, as if to say Where have you been? We’ve been waiting for you. Tonight she speaks of this newfound delight with a happy lilt and gives a soft praise for a most unexpected gift, a new joy, unforeseen. The love of children. And all she did was say yes. Tonight a friend is filled with praise, celebrating 11 years of sobriety. We cheer and clap hands and pound his back and eat more cookies. My, what a fortuitous, fluky lot we are. A safe place, a kind community of seeking souls. Come as you are. What a privilege to count myself among them, this curious, sacred company. A peculiar people, this sweet community of broken folk. All of us tip-toeing carefully through our pain, hand hard on the shoulder of another who has felt similar stings, one who now stands alongside. It’s a curiously choreographed dance, a love-filled frenzied ballet en pointe, a delicate search for balance. In a pas de trois, the dancers move together in symmetry through much of the dance, before attempting a variation alone, a solo. The pas de trois concludes with a coda, a finale usually set to music of a quick tempo in which the dancers bring the piece to a spectacular finish. A spectacular finish. Who could hope for more? We come together on Wednesday evenings to learn to move with a bit more ease, a bit more symmetry, to help each another prepare for the certain solos that come. Sometimes our collective movement bends toward dignity, elegance even, but mostly we creep and limp and wave hopeful hands at joy and joy and joy-to-come. A collective slouch toward grace ~ the secret of a community of the broken. We are here to help each other toward a more spectacular finish. And in that pursuit, there are flashes of joy here tonight, splashes of love, dancing above the cookies. One of us has been sick, stumbling and falling, and hasn’t been here for a while, but tonight she comes, holding tight to an arm as she threshold-crosses. She settles snugly in the brown leather chair by the fireplace and I bring the coffee hot ~ don’t get up, please don’t fall again. She is a quiet, rarely speaking, ever listening, coffee sipping. We are here. So we begin. Our sacred few mid-week moments commence with words of praise, thanksgiving, efforts at gratitude for the things in our lives, even the hard things. Beauty in the spoken word, encourage the brethren. Who has something she is grateful for, something that will encourage us as we begin? Where have you seen God at work in these days? A hard question for broken folk. Tonight it is quiet. No words yet, just a settling in, breaths deep. Rough week. The coffee-drinker in the leather chair moves, scoots forward. She has been so ill and gone from us so long. Quietest of us, hard to hear, we are unaccustomed to her voice. She opens her mouth to try to offer words of praise, to speak. But instead, this night, she surprises us, surprises herself. Her scratchy, throaty voice fills, lifts up to the ceiling beams, so unexpected to us and to her, elegant, ethereal. A sudden song of stunning praise. Unrehearsed. One by one, we reverently join her song, we creatures here below, trying to praise Him in this astonishing moment. Doing our best, throwing tattered rags of praise at holy feet. Are they singing with us, even now, the heavenly hosts? Shhhhhh. Do I actually hear their heaven-voices echoing in my den? Are the birds and trees joining in? I think maybe they are. “I’ve never done anything like that before,” the singer marvels as we wipe tears. Isn’t that what a miracle is, something inexplicable, never done before? The wondrous, humble miracle of praise, a sacrifice. I can hear notes still ringing in the high rafters of my den, the birds warbling forward the tune this morning as I write. Can you hear it? Quiet enough to hear the miracle? The miraculous sacrifice of praise is earth’s first song. Of course. We live on Arctic ice floes, drifting, hard-stuck in the ice, under-provisioned. If we have any hope of being able to hold on, we must supplement our stock and store, bring in fresh supplies, replenish and refill with regularity. There has never been a successful solo Arctic explorer. No man is an island. Our mid-week hour is short ~ too soon comes the time to dance back over the threshold into the world. These dancers and singers are slow departers, unhurried leavers. Can’t we just stay here? This togetherness works for us, and I am always melancholy to dim the last lights. The beauty of the pas de trois is that it is danced together, each helping the other to achieve greatness, a spectacular finish. Together in our little community, we dance ~ our broken, painful, crooked, beautiful, scarecrow ballet, and God says It is good. Here, I becomes we. Us. Let us go forth in joy, to love and serve the Lord. Let us dance. 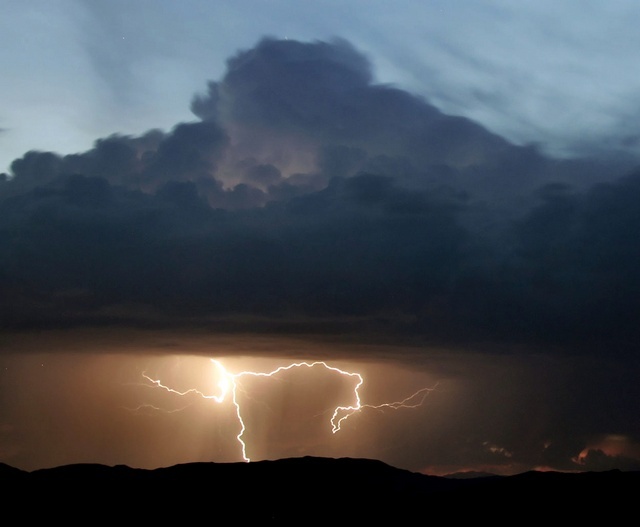 It is the first big spring storm after a particularly long, cold winter. Dave Brown predicted its arrival with great accuracy, as weathermen can these days, almost to the hour, which in this case was somewhere around 2:51 am. I heard the dog before I heard the thunder. Joe hates storms. Most dogs do, I hear. His heavy and panicked breathing arrived at my bedside just before the lightning and thunder ~ he felt it coming. Joe is either polite or fears being sent back to the kitchen, but he remains quiet through the noise of the storm outside, no barking, no protest. It’s his breathing that gives him away, quick and heavy at the same time, out of control. The very air is different in the storm. Thick, warm spring air has invaded the space of the clean, cool winter air and they fight for position. Warm spring air will win this one. The electricity of their fighting awakens the earth and breaks the hard ground open for filling. The flowers will appreciate it, but Joe does not. In the morning, I expect, the buds on the lilac trees will be more fully open than they were on yesterday’s walk, and the spring grass just a bit greener. Things are often much better after rain. Joe just wants it to go away. He doesn’t care about the flowers and trees and grass. All he can see and feel is the intensity of this moment. 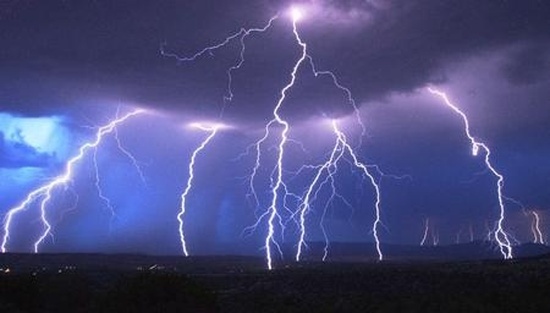 The lightning is over-bright and hot and silver-lights the room and distorts the true color of things. What is real is overpowered by light and sound. He feels the very floorboards of the house beneath him shiver and hears the plates rattle hard on the rack and he is sore afraid. He has neither knowledge nor ability to look beyond this moment. With every heavy thunderclap, I hear him inching closer. He will not jump up onto the bed, but he will get as close as he can. One needs companions in times like these, so I lay my arm over the edge of the bed to comfort him. Does he hear my breathing like I hear his? Am I panting as hard as he is? I am not. Although I am now fully awake. I get up and patter through the kitchen to the back porch and open the door. Joe follows me close. The birds let me know the storm is passing, and cool air gentle-flows into the kitchen, clean. Even in the dark I can see that everything is saturated, crepe myrtle and rose bushes, daffodils and new grass, all clean, renewed, baptized. Pressed down, shaken together, running over. Joe will join them outside soon, when the sun starts to come up. So will I. 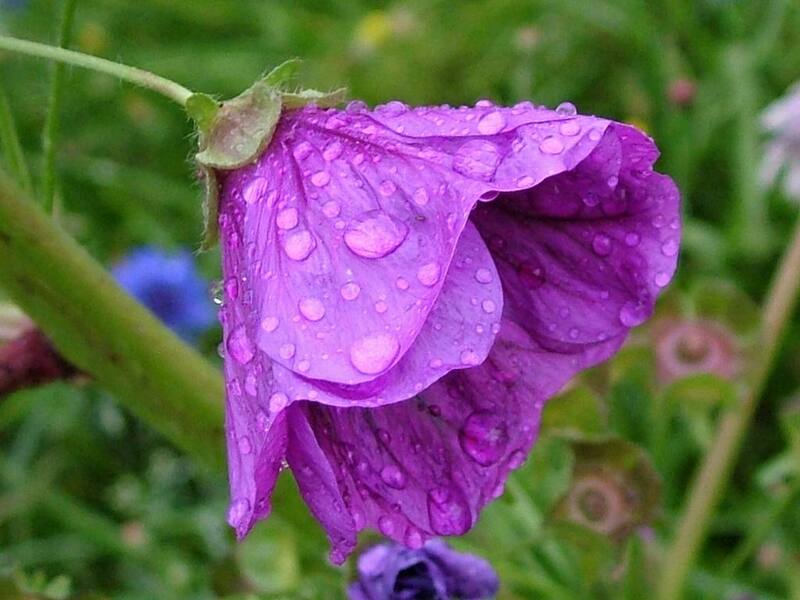 To breath fresh air and hear birds sing and look at the wet flowers after the storm and remember. Remember that Behold! once there arose a great storm on the Sea of Galilee and the boat was being covered with the waves. He was asleep but His disciples roused Him, shouting. Like my dog Joe, they too were sore afraid. The Master stood up and spoke to the storm, “Silence!” and the sea became as smooth as glass. And the men marveled. Today I marvel. The cleansing power of this storm renews. There is hope in it, promise even. The birds shout and the daffodils whisper the message ~ Come out! Be strong and courageous. The storms that God allows He also calms. Today I will be re-baptized in this promise. I am grateful. So is Joe.